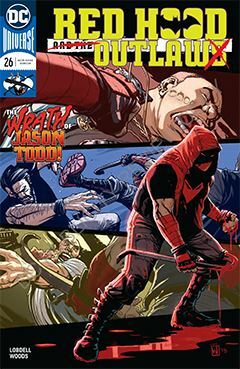 Jason Todd is on a bus headed nowhere in particular when he encounters an injured FBI agent. Being the anti-hero he is, he chooses to step in and address the situation, only to have it go sideways. It seems to me I’ve read such scenarios before, usually in novels with the words, “Jack Reacher” on the cover. And that’s how Jason comes across: passive but confident in his promises of retribution. Jason Todd is regarded as more villain than hero, and if this is a new direction for the character, I’d just as soon pass. He’s got a bit of a new look, a new mask (think Winter Soldier, another sidekick brought back from the dead). As for his most recent partners, there is as yet no sign of them. I don’t know if that means they’ve been written out of the book entirely or not. I found Red Hood and the Outlaws to be derivative from issue #1, and it’s still derivative, but just in a different way. I would prefer to see a more original direction for Jason Todd, so hopefully the whole Jack Reacher stuff is just a phase. Pete Woods artwork is well-suited for the crime genre Red Hood is a part of. Yes, it’s a super-hero concept, but it deals more with criminal biker gangs and modern era gangsters, rather than maniacal super-villains. As part of the Batman family of titles, it could round out the many different iterations of what it means to be a part of that.